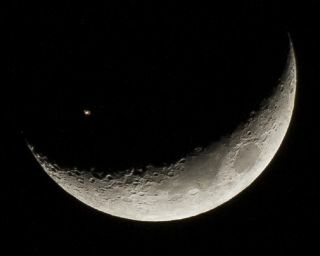 This image shows the International Space Station transiting the Moon. Juan Gonzalez-Alicea captured the image on Dec. 6 from western Puerto Rico using a Canon 7D with a 300 mm lens. The International Space Station can be seen cruising in front of a crescent moon in this stunning night sky photo recently sent to SPACE.com. The moon is 222,800 miles (358,700 km) away from Earth while Venus is currently approximately 38.5 million miles (61.9 million kilometers) away.